Many of us may encounter the situation where we find we cannot watch the WMV files on some devices or media players. It is very frustrating, but how to solve this problem? The easiest way is to convert WMV to MP4. 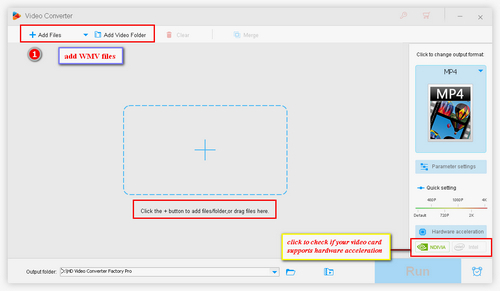 In the following guide, we will share with you a quick way on how to convert WMV files to MP4. Just free download the video converter and continue the conversion process. As we know, WMV is a relatively old but still popular video format. But since it is developed by Microsoft, its major playback platforms are Windows. So many people may be troubled by the problem that the WMV files are not compatible with some non-Windows platforms. How to solve this worrisome problem? The easiest and efficient way is to convert WMV to some more compatible video formats. MP4 is a good choice. Its high compatibility makes it the most prevailing and widely-used video file type. Follow the guide to get a further solution on how to convert WMV to MP4 with ease. HD Video Converter Factory Pro can convert WMV to MP4, AVI, MOV, MKV and other 100+ formats and 200+ devices, no need to worry about incompatibility issues anymore. And it has the 50X highest conversion speed than any other WMV converter, saving your time and energy. HD Video Converter Factory Pro is an easy-to-use WMV to MP4 converter. It can ensure your WMV files original quality while making the high-speed converting to MP4. Meanwhile, it is 100% clear and secure during the converting process, with no risk of data loss or privacy leakage. Moreover, it can convert WMV to other video formats, like converting WMV to AVI, converting WMV to MOV, MKV, etc., meeting all your converting needs. 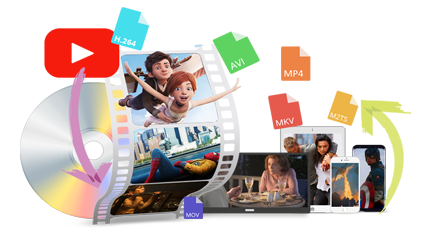 With the help of HD Video Converter Factory Pro, you can easily convert WMV to MP4 without any trouble. So, that’s why I highly recommend this best WMV to MP4 converter to you. Before we start the process, just free downloadfree download HD Video Converter Factory Pro and install it on your computer. Step 1. Import WMV Files to the WMV Converter. Launch the easy-to-use WMV to MP4 converter on your computer, then click “Add Files” to add your desired WMV videos to the program, or you can just drag and drop them to the main interface. Step 2. Choose MP4 Format to continue the WMV Conversion Process. Click the Output Format window on the right of the main interface and select MP4 under the Video tab. As you can see, there are various of videos formats. If you want to convert your videos to other formats, just choose the wanted formats. 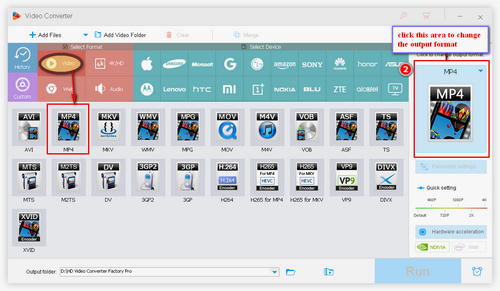 Also, HD Video Converter Factory Pro supports to convert videos to a certain device, like converting videos to Android, converting MP4 to Samsung TV, to solve the compatibility issue between videos formats and devices models. Step 3. Start to Change WMV to MP4. After choose the MP4 format, just click RUN button to wait for the conversion process. The WMV to MP4 converting process will go automatically and perfectly. 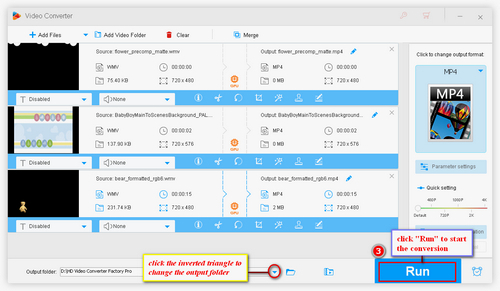 Of course, before you click the RUN button, you can select the output location of the MP4 format videos by clicking folder icon beside the Open Folder on the bottom of the main interface. Now, you can easily and quickly convert WMV to MP4. As the guide mentions above, it is very easy and convenient to use HD Video Converter Factory Pro to convert WMV to MP4 without any quality loss. Now, with the wonderful video formats converter, you can watch your favorite videos on any devices no matter what kinds of formats they are. If you think this article is helpful and does fix your WMV to MP4 converting problem, you can share it with your friends. HD Video Converter Factory Pro also supports GPU acceleration, which makes the conversion speed much higher, up to 50X. Besides, it allows you to adjust the video parameters, like resolution, bit rate, frame rate, etc., to make your videos more fluent and clear. Moreover, it supports compressing videos to a quite small size with a relatively high video quality. Best and Fastest WMV to MP4 Converter Free How to Convert WMV to AVI Efficiently and Safely How Do We Convert MSWMM to MP4, AVI, WMV, MP3, MOV?